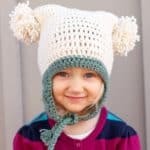 In this quickie tutorial, I’m going to share how to make a pom pom for a hat and how to easily attach it. The potential of pom poms is actually the reason that I won’t get rid of any yarn in my stash. Not even the little straggly pieces that have really have no hope of ever being knit or crocheted into anything. They could become fluffy little balls someday and thus, they remain safely strewn about tucked away in my craft room. 2. Wrap your yarn and cardboard will yarn as pictured. Don’t hold back here. Wrapping too little will result in a wilted-looking pom pom. 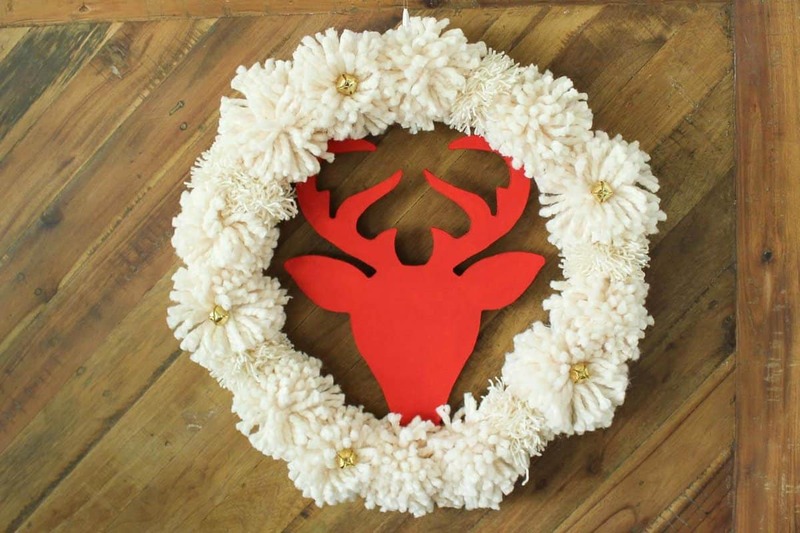 If your cardboard is bigger, you’ll also need to wrap more times to give your pom pom enough poofy-ness. 3. 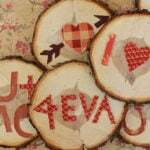 Continue to wrap until you’ve loaded up your cardboard with a good snuggle of yarn. 4. 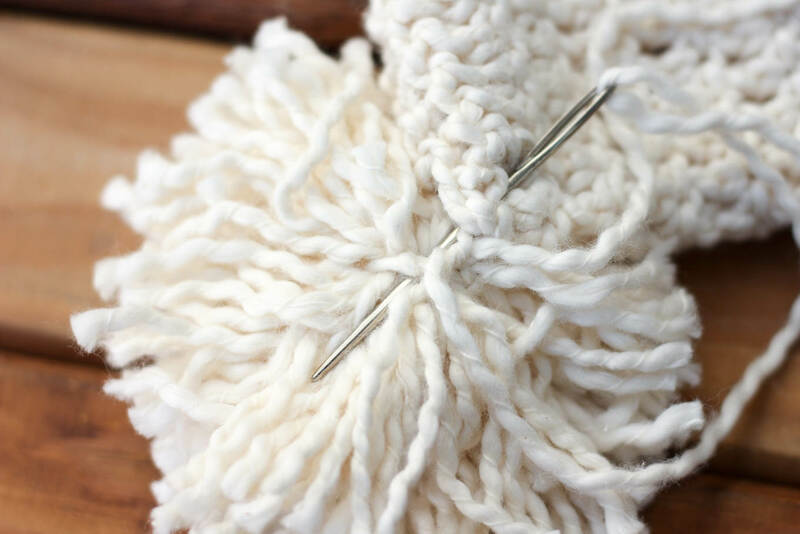 Use the short “belt” piece of yarn to tie a tight knot around all of the wrapped yarn. Really synch it down as tightly as you can. 5. 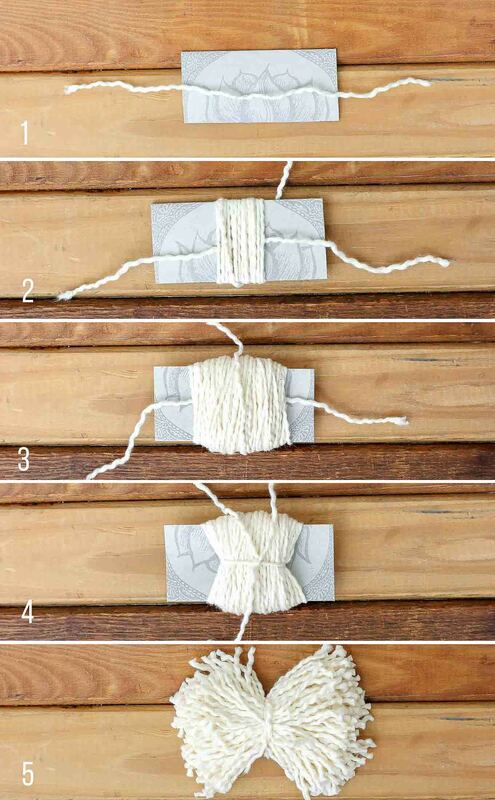 Flip your cardboard over and cut through the middle of all the pieces of wrapped yarn. 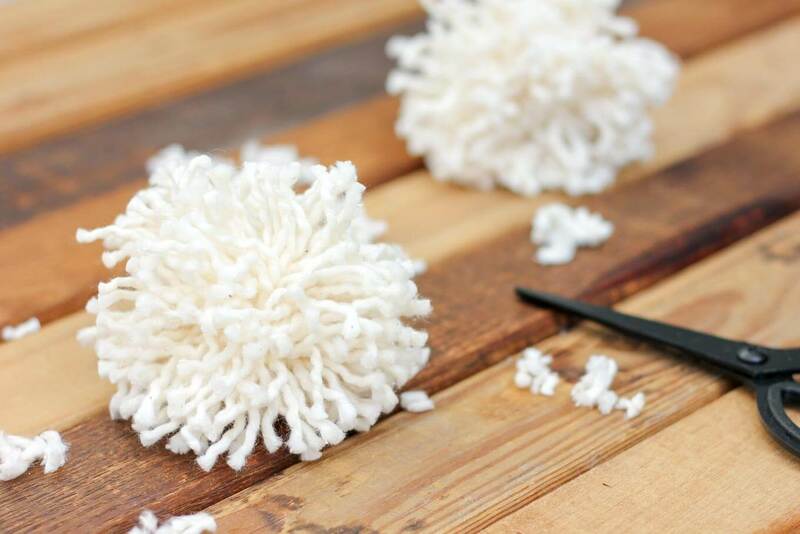 Keep your pom pom laying flat and wrap the middle “belt” yarn back around the pom pom and tie it as tightly as possible one more time. 6. 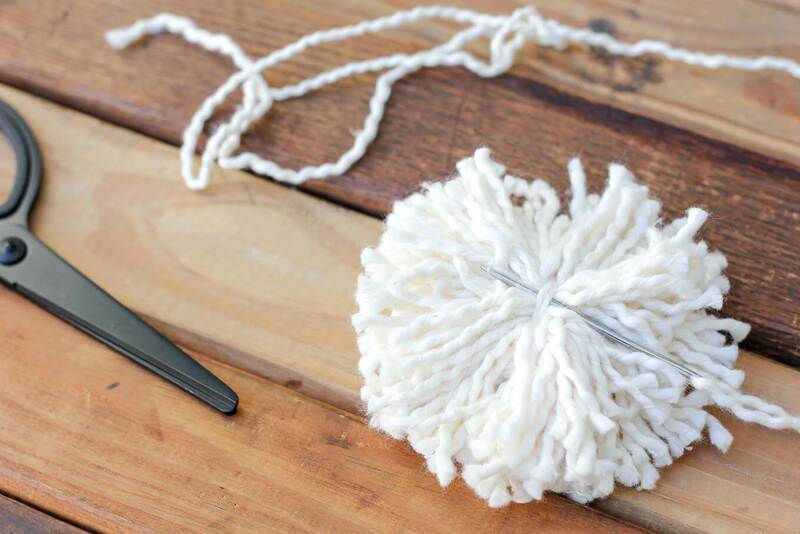 Fluff your pom pom and trim all the pieces of yarn to the same length. 1. 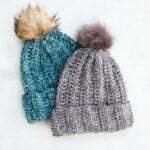 Using a tapestry needle and a piece of yarn that’s the same color as your hat, pull your needle underneath the “belt” of the pom pom. 2. 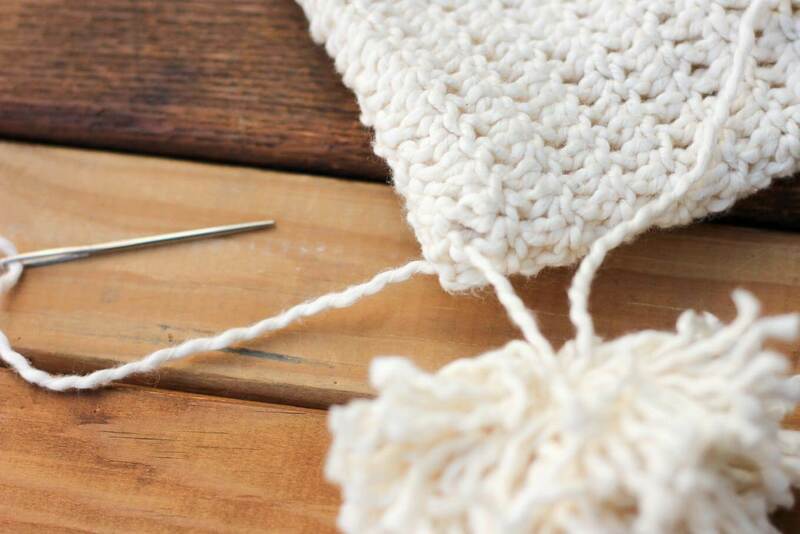 Pull the needle through one or two stitches of the crocheted “fabric” of your hat. 3. Repeat steps 1 and 2 so that your yarn in wrapped through your pom pom and your hat twice. 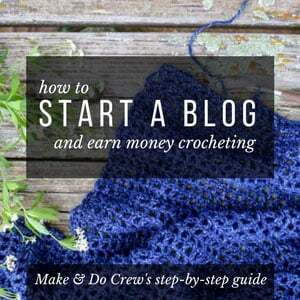 Pull the yarn together and tie it in a few knots. 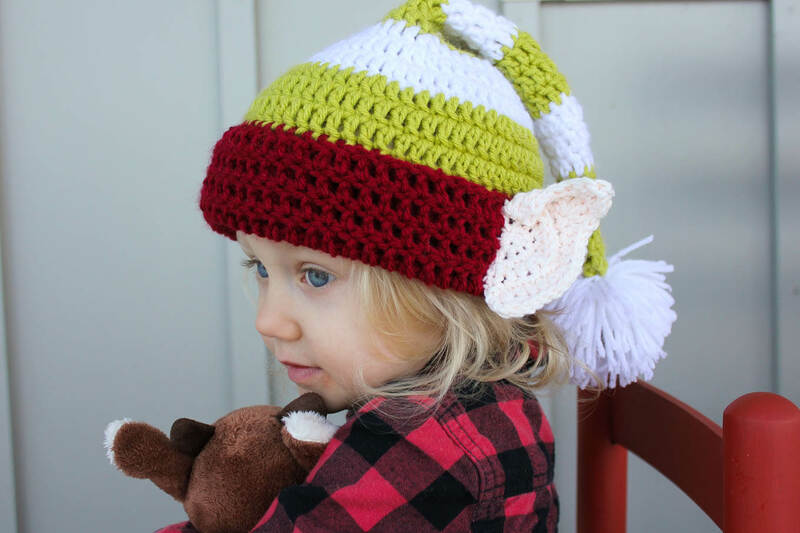 Thank you so much for sharing this pattern, someone recently asked me to make one and though I’ve been crocheting for almost 4 years..i think. I enjoy a good easy project and it was lots of fun, I made mine with stripes of mint, white and purple. 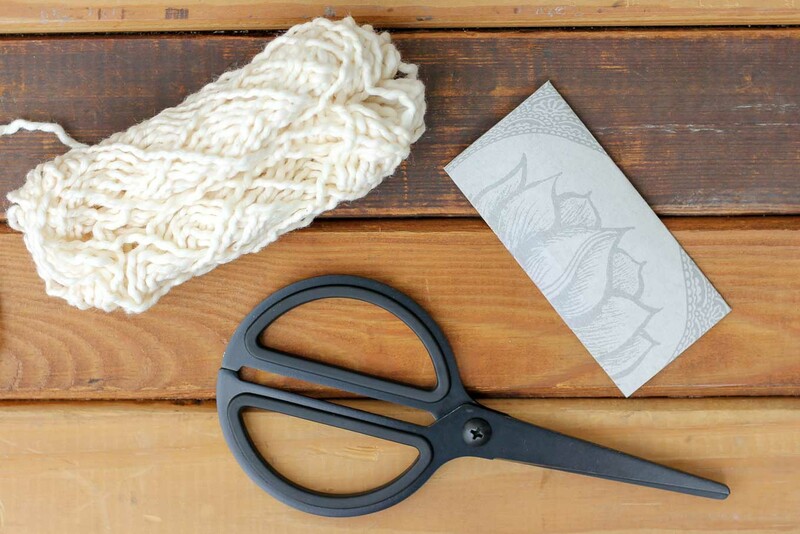 BTW I really like those scissors in the picture, I’m shopping for some new scissors! i love love the rug. went straight out and bought pompom makers….easier for me…..and went to work. i am learning quickly which yarn NOT to use. i have more fuzzy bits all over the couch, chair, rug my blankets and my dog than i do in the pompom. i do have a question. does the ‘lumpy’ feel disappear when all is done? should i be making less dense poms? Ha–yes, the fuzz. That happened to me too a bit, but it generally stopped shedding by the time I finished the rug. I walked on my rug today to see if I could answer your question about the lumps. Mine def has lumps in it, but they’re nothing I’d consider annoying. 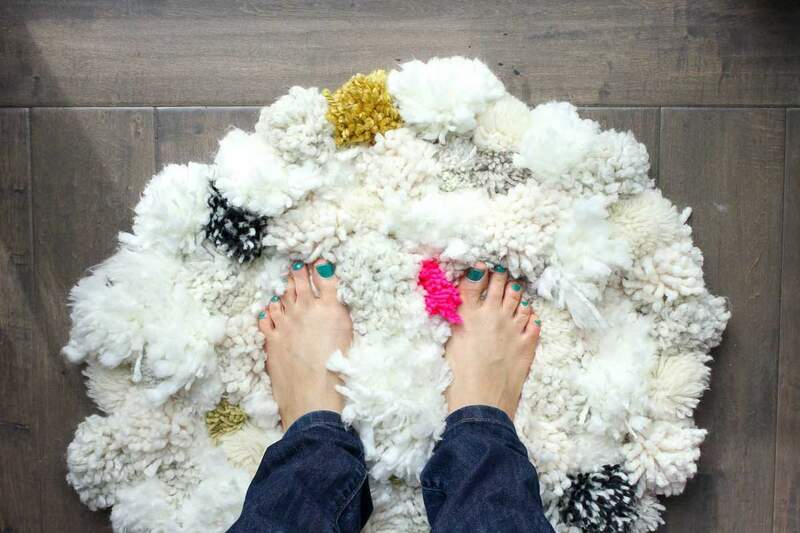 I find that they become far less noticeable once there are a lot of pom poms snuggled together on the rug. I need some help with attaching the pom poms to the matt, I apparently am not doing it right or have the wrong type matt. I can try to help you! What seems to be going wrong? I just tied them into the mat grid with the longer piece of yarn that I used to tie around the pom pom when it was created. Then I tied several knots to secure it to the mat. Does that make sense? 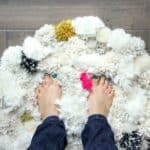 Where can I buy the rug mat? I’ve got a boat load of yarn and that pin pin rug is just perfect.